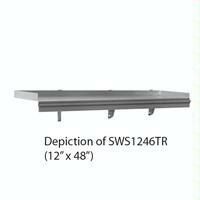 Eagle Snap-n-Slide Wall Shelf with Ticket Rail. Unit constructed of heavy gauge type 430 stainless steel. Ticket rails have floating ball mechanism to hold checks in place, and are mounted to flat front of shelf with provided tape. Front of shelf is flat and features “tape-on” ticket rails, which are supplied with tape and are to be attached in the field.